As I'm a big fan of Russian literature I'll be back at the Tron Theatre soon to see a version of Gogol's The Gamblers, but this week they are showing Anton Chekov's Three Sisters, adapted by Paisley born artist and playwright John Byrne. He too clearly has an affection for Russian works, having previously written versions of Checkov's Cherry Orchard and Uncle Vanya. 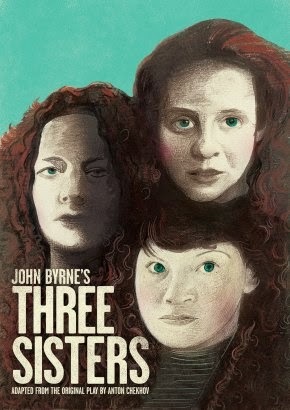 Although there are several sly references in this version to the play's Russian origins, Byrne's Three Sisters are stuck squarely in the provincial world of 1960's Dunoon. They are pining for London and this perfectly recreates the ennui and petty parochialism the original family felt when stuck 1000s of miles away from Moscow. The sisters and their ineffectual brother, played by Jonathon Watson, feel superior to the locals culturally and intellectually and struggle to find a role in life. With John Byrne you get the whole package, play and designs and it was nice to see his costume designs on the corridor walls at the interval. When I was a youth, in the 1980s, I only ever went to Dunoon to take part in demonstrations at the American Navy submarine base. A quiet seaside town, the British navy started a submarine base at Dunoon in the Second World War, but the town became a true garrison town when the Americans arrived in 1961. After 30 years they left and on a visit to Dunoon recently it did look rather like its best years were behind it. As a protester I always preferred a jaunt to Dunoon rather than Faslane, as the former demonstrations were held nearer the town and you could always get a wee go at the Shows. At Faslane it meant getting a lift up to the base in someone's Lada from the station at Helensburgh. Another person who may have been nostalgic for old Dunoon is Sylvester McCoy. The seventh Doctor Who plays the doctor; in this as old family friend Dr MacGillivery. The actor was born in Dunoon in 1943 and seems to be having fun playing the eccentric character, even getting the chance to show off his spoon playing skills (see it here in "Time and the Rani"). Putting the play in this time and place works well, with a handy nearby supply of military characters, led by the ever watchable Andy Clark. The sisters play out their respective loves, frustrations and losses, their dreams of getting to the far off, remembered, cosmopolitan idyll slowly die. The red haired sisters played by Jessica Hardwick, Muireann Kelly and Sally Reid feel bonded (unlike Jessica Hardwick's distractingly strange ginger wig). I spent a wee while with Jonathon Watson on stage trying to guess which Scottish footballing character he was trying to be (Bertie Vogts I decided). His Wemyss Bay beau is played with gusto by Louise McCarthy and Stephen Clyde plays the damaged, unsettling and destructive sailor Maloney. Many of the common themes of Russian literature of the time are played out here. People with aspirations for greater things tied down as bureaucrats away from influence, the upper classes trying to find their role in a changing world and the querulous and demanding lower orders refusing to accept their place in the world. It's all that misery that keeps me coming back to Russian literature. The play runs for another week in Glasgow before transferring to Edinburgh.